This is the spellbinding tale of a mysterious Coney Island doctor who revolutionized neonatal care more than one hundred years ago and saved some seven thousand babies. Dr. Martin Couney's story is a kaleidoscopic ride through the intersection of ebullient entrepreneurship, enlightened pediatric care, and the wild culture of world's fairs at the beginning of the American Century. 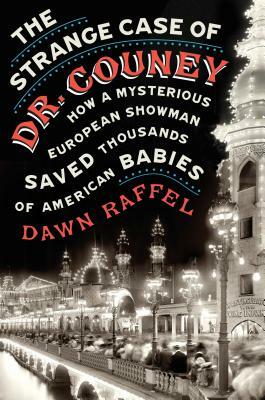 Drawing on historical documents, original reportage, and interviews with surviving patients, Dawn Raffel tells the marvelously eccentric story of Couney's mysterious carnival career, his larger-than-life personality, and his unprecedented success as the savior of the fragile wonders that are tiny, tiny babies. "With colorful descriptions of the carnival world and the medical marvels of early neonatalogy, Raffel makes a fascinating case for this unusual pioneer’s rightful place in medical history." "Many readers will share Raffel's admiration of Couney... The book's title is no hype; this is a startling account of an improbable huckster who made his living promoting a lifesaving device." "Long before modern neonatal clinics made it possible and even commonplace to save premature babies, Dr. Couney’s “infant incubators” welcomed the “tiniest bits of humanity” into the world with two drops of brandy and a show name. A fantastic, carnivalesque story filled with twists and surprises, The Strange Case of Dr. Couney entertains with a delightful assortment of historical oddities and a serious, sobering look at health practices, missteps, and unexpectedly resourceful advances in American medicine." "In carnival midways in the early decades of the 20th century—amid carousels, elephants, fire-eaters, and pie-eating contests—a gentleman of indeterminate origin, of unspecified medical background, displayed premature human babies in incubators that looked like arcade games. They were real babies, not wax; struggling to live; at home among the “Human Oddities!” of the side-shows only because preemies weighing two or three pounds at birth didn’t ever survive, had rarely been seen. Fair-goers bought tickets and lined up to gawk at them, and were asked to refrain from trying to reach in and poke the infants. Though Dr. Couney (both the prefix and the name were inventions) was more showman than doctor, he saved the babies' lives by the thousands and pioneered American neonatology. His story is richly told in a book that savors every honk of John Philip Sousa from a marching band, every salty crunch of carnival popcorn, every sparkle of a Ferris wheel turning in a night sky, and the desperate hopes of parents traveling from their lying-in hospitals by bus or subway to the carnivals, carrying their premature newborns in shoe boxes and hat boxes or inside their coats."